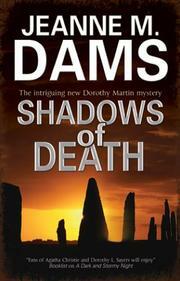 Welcome to the Orkney Islands, home to Stone Age excavations and a very modern murderer. Retired Chief Constable Alan Nesbitt, his wife, Dorothy Martin, and their dog, Watson, arrive in Orkney in style. When their own car breaks down, they hire a plane and then a car to take them to the vacation apartment their potter friend Andrew has found for them. A recent Neolithic discovery proves fascinating to Dorothy, who was leery of the trip. But the fabulous finds at the dig on one of the smaller islands provoke disagreement among the farmer who lives there; Robert Fairweather, the director of the dig; Henry J. Carter, the wealthy, arrogant American who’s bankrolling it; and Charles Norquist, the fanatically purist director of the Ancient Orkney Museum. When Carter is found dead at the dig and an accident is ruled out, the farmer is the first suspect. The local authorities, overwhelmed by a terrorist threat, ask Alan to look quietly into the murder. Alan doesn’t fancy the farmer as the murderer despite the threats he made. So he, Dorothy and even Watson start digging for information that might implicate someone else. After Dorothy’s cleared of killing a feral cat, she finds the local women more than willing to talk. When Norquist vanishes, the sleuths decide that he’s either a person of interest or the next victim. To complicate matters still further, Norquist’s horror of a mother, who’s in a home suffering from mental problems, may hold the key to the mystery. Dams extends her list of pleasant British cozies (Murder at the Castle, 2013, etc.) with another installment marked by her trademark local color and another solid mystery.